This course provides an overview of the concepts, techniques, and approaches for engineering micro-scale pieces of biomimetic, functional human tissues. These engineered cellular systems have applications in regenerative medicine and as new tools for screening drugs and studying human development and disease as “Organs on Chips”. Cellular engineering addresses issues related to understanding and manipulating cell structure-function relationships. This course is intended to bridge between cell biologists and engineers, to understand quantitatively cell biological aspects. Central to biomaterial and tissue engineering is our use of cells and our understanding of their interactions with their environment. Students are provided with an introduction to engineering principles and modeling at the cellular level. 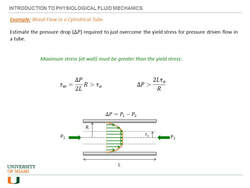 Fundamentals of transport phenomena in biological systems including diffusion, osmosis, convection, electrophoresis, and transport with binding. Applications to cell electrophysiology and drug delivery. Introduction to physiological fluid flow in tissues. Introduction to biomedical engineering analysis, design, and manufacturing processes. Ethics, regulatory factors, and biomedical engineering design tools (mechanical, electrical and computer tools) are introduced. Hands on experience is provided through a project in which the students design, assemble, program, and test biomedical devices.